Eagles wide receiver Nelson Agholor (13) dives past Washington Redskins cornerback Fabian Moreau (31) for a touchdown in the third quarter of a game at FedEx Field in Landover, Md., on Sunday, Dec. 30, 2018. The Eagles won 24-0. LANDOVER, Md. – An unsung hero. That’s what Eagles offensive coordinator Mike Groh called wide receiver Nelson Agholor a couple of weeks ago. It sounded like a hollow compliment at the time. Something you say about somebody who isn’t playing particularly well. Two days before that, the fourth-year wide receiver, who had had a breakout season last year in helping the Eagles win the Super Bowl, caught just one pass for eight yards in the Eagles’ critical 30-23 road win over the Rams. In the previous five games, he had eight catches – just three for first downs -- for 125 yards and no touchdowns. “I think a lot of people scoffed when Mike made that comment,’’ Eagles tight end Zach Ertz correctly said Sunday after Agholor caught a pair of touchdown passes in the Eagles’ 24-0 win over the Redskins, which, coupled with the Bears’ 24-10 win over the Vikings, helped the 9-7 Eagles clinch the final wild card playoff spot. Last week, Agholor had five catches for 116 yards in the Eagles’ 32-30 win over Houston, including a big 83-yard touchdown pass from Nick Foles late in the third quarter that gave the Eagles a 23-16 lead. The touchdown snapped a personal 14-game drought without a scoring catch for Agholor, who had eight touchdown catches last season. On Sunday, he had five catches for just 40 yards, but had the first two-touchdown game of his career. He caught a two-yard touchdown pass from Foles with 1:25 left in the third quarter that initially was ruled an incompletion, but was reversed after Eagles head coach Doug Pederson challenged the call. Then, in the fourth quarter, he caught a 22-yard touchdown pass from Nate Sudfeld, who replaced Foles after he left with a chest injury. “I just tried to get the edge,’’ Agholor said of his second touchdown, a short pass from Sudfeld that he was able to take up the sideline. Agholor has three touchdown catches in the Eagles’ last two games. He no longer is an unsung hero. “Obviously the numbers and statistics always make it a lot better,’’ he said. “And it also makes it more visible for people outside of the room. “But at the end of the day, I thought that was a great compliment from Mike Groh. Because, at the end of the day, he coaches me. He puts me in position, and he’s taught me so much about the game so that I can help the team. After struggling his first two seasons in the league, Agholor had 62 catches last year, including the eight TDs. He led the team in third-down receptions and was a key part of their playoff success, catching 15 passes in three postseason games from Foles, eight for first downs. He’s also their best blocking wide receiver, which is why he has played 90-plus percent of their snaps this season. He’s usually on the field regardless of what personnel grouping the Eagles use. “Everybody is so excited for him every time he succeeds because, we understand what he went through (his first two years), the guys that were here then,’’ Ertz said. “He’s playing at a really high level. He makes a lot of big plays in the passing game. His speed opens up a lot of stuff for Alshon (Jeffery) and myself. So even when he’s not catching a lot of passes, his presence still is felt. 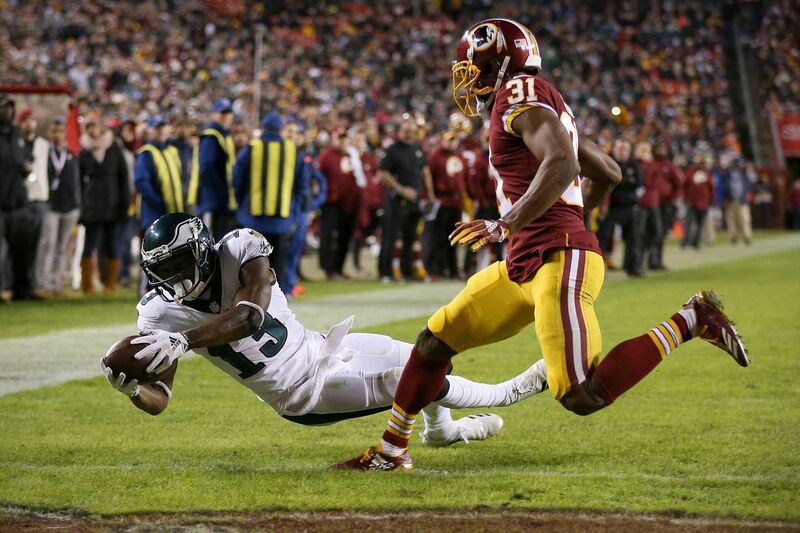 The Eagles ran the ball effectively Sunday, rushing for 129 yards on 34 carries against the Redskins. Still, it’s better when Agholor also is contributing as a pass-catcher. He did that last week against Houston with the big 83-yard touchdown catch, and he did it again Sunday against the Redskins. “We needed that,’’ Agholor said after the Eagles found out they were going to the playoffs. “It was exciting. I’m glad that, at the end of the day, we handled our business. We’re just having fun. We’re being in the moment. Everybody’s playing for each other. At the end of the day, each week, I see us getting closer. And that’s what you want.